At Better Batter, we believe that you should eat freely. We believe that everyone should eat real-tasting food, using regular recipes, at reasonable prices. We’re committed to developing and marketing the very best in gluten and allergen free products, and we pledge to do everything we can to meet your dietary needs in an affordable manner. We’re constantly looking for ways to save you money and to put products into your hands that make sense. When you buy Better Batter products, you’re not going to find allergens, sub-par ingredients, hidden costs (like the need to add your own xanthan gum or fat) or chintzy portion sizes – when you order our products, you’ll get a full sized product that will be good enough to feed anyone without apology. What would it profit us to gain a fortune and lose our souls? We donate at least 10% of our net profits to social and charitable causes. We encourage our employees and customers to present us with a wide range of causes to support to partner with us in finding ways to make a lasting impact in this world. We give particular weight to causes that promote our values of providing for and protecting the poor, widowed, orphaned, or oppressed. We are passionate about changing the world and we believe strategic partnerships with key organizations can help us feed, clothe, educate, and support the destitute and those with no voice. We currently support Worldvision’s water projects and plan to increase our giving and partnership with them as we mature as a company, to include other key areas of need. We are partnered with The Burma Project, a prototype solar power project, through Need organization, which enables students within an extremely isolated environment to have access to technology and electricity in order to learn critical skills to teach their villages sustainable, economically supportive farming practices. We also partner with Blair Hope for families to provide financial aid to foster care families to allow their families to provide childhood experiences beyond simple food and clothing – things the government programs don’t provide funds for – such as family trips or christmas gifts, and to provide financial aid for those wishing to adopt U.S. children but unable to afford the fees. Because of our founder’s personal family history, we are particularly focused on autism – allowing those in the autism community to advocate for the health care needs and social acceptance of their own community’s condition is something that we are increasingly passionate about. We are partnered with the Autism Self Advocacy Network for financial support. We also give Financial Aid Assistance to those with autism through our Financial Aid program. We currently support local and national support groups, such as the GIG and CSA, gluten free food banks, and volunteer led gluten free fundraisers through direct financial contributions and donations of products as well as provide direct financial aid for those on fixed/low income who may have celiac. Do you miss Shake 'n Bake or the red and white bucket from that 'southern' fried chicken company? 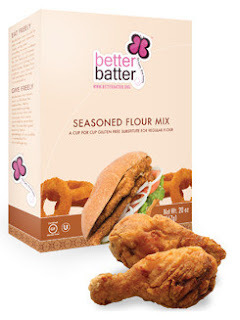 Better Batter Gluten Free Seasoned Flour is already preseasoned and perfect for frying, baking, and making gravies! Your purchase of this product helps support our humanitarian projects and hunger relief programs. Better Batter Gluten Free Seasoned Flour is so delicious! I absolutely love this seasoned flour and think it can bring just about any dish to life. I was so bored with chicken until I tried this! It has so much flavor and really helps to seal in juices. I also used this to make some delicious seasoned french fries so it's very versatile and is oh so yummy. It's gluten free which is so important these days with so many going gluten free. No longer do you have to sacrifice flavor! Get your hands on some of this Better Batter Gluten Free Seasoned Flour and enjoy a wonderful savory full flavored meal! Click HERE to learn more about Better Batter! Click HERE to see other products by Better Batter! Follow Better Batter on social media!